This creamy garlic pasta is fast, simple, and delicious! A weeknight favorite. This easy pasta recipe can be on your table in about 15 minutes! Sometimes you just want comfort food. And fast. This pasta does this trick! There’s plenty of creamy pasta recipes out there… some made with cream, and others with cream cheese or milk. You can’t beat the taste of real cream, in my opinion, so that’s what I went with. 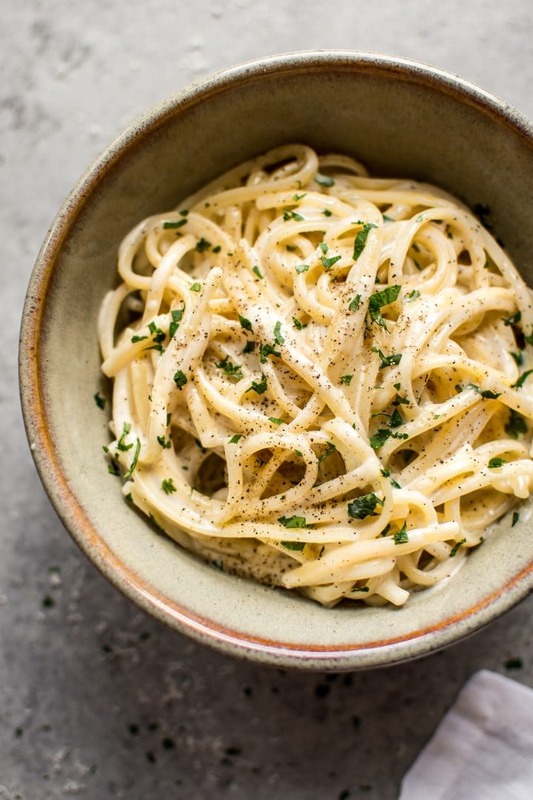 This recipe isn’t far off fettuccine Alfredo, so if you like that, you’ll probably like this. Make a quick roux with the butter and flour, then stir in the garlic and chicken broth. You then add the cream and let the sauce thicken. Just prior to serving, add the parmesan cheese and fresh parsley. Toss with the pasta and enjoy! Sooo easy. And that creamy garlic sauce is so tasty. Pro tip: You could make this creamy pasta sauce with milk or half-and-half, but I haven’t tested it out. You’ll end up with a thinner sauce, but you will save some calories. If you do want to go that route, I suggest adding a touch more flour (but not too much more – you don’t want it to taste too floury) and/or cooking it for a bit longer so it reduces. I used chicken broth because it adds a lot of flavor to this simple dish. You could sub with vegetable broth if you really need this dish to be vegetarian, but I do personally prefer the taste when you use chicken broth/stock. I like this pasta as-is, but it’s a great blank canvas for adding in cooked chicken or other type or protein. You could even add some veggies (try a handful of peas) if you wanted to. I used linguine, but any kind of pasta (whatever’s in stock in your pantry!) will do. Penne would work great in this creamy pasta dish. I definitely recommend adding the parsley because it livens the dish up a bit. The freshness and touch of green is the perfect balance to the decadence of the creamy sauce. I hope you will love this easy creamy garlic pasta recipe! Will you give it a try? This creamy garlic pasta is fast, easy, and delicious! A weeknight favorite. This easy pasta recipe can be on your table in about 15 minutes! Boil a salted pot of water for the pasta. Cook pasta al dente according to package directions. When the pasta isn't far from being cooked, it's time to start the sauce. Melt the butter in a skillet over medium-high heat. Stir in the flour and let the roux cook for 2 minutes, stirring often. Stir in the garlic and chicken broth and let it simmer for about a minute. Add in the cream and let the sauce cook for a few more minutes until it's thickened to your liking, then add the parmesan cheese, salt & pepper as needed, and parsley. Drain the pasta and toss with the sauce until well coated (add a little pasta water if you wish to thin the sauce a bit). Serve immediately. I do all the prep while the pasta is cooking, so that's why I don't put anything for prep time. You may also like my lemon parmesan chicken Alfredo recipe or my 15 minute creamy Alfredo gnocchi recipe. What kind of vegetable would pair well with this? Yum! I made this tonight for dinner. It was a hit! So delicious & easy. It’s added to my recipe box. I paired it with peas & it was delicious!